The word spilled from my mouth. 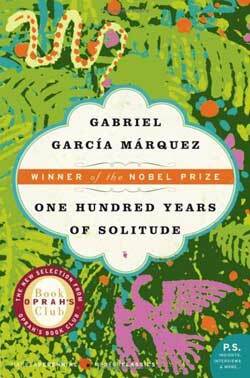 Perhaps meaningless, still, the occasion called for something immodest as I reached the end of Gabriel García Márquez' One Hundred Years of Solitude. The novel, written in the 1960s and translated by Gregory Babassa, follows the story of the Buendías for a period of six generations. Within that family, over the course of a century, we pay witness to humanity in its every permutation: in youth and old age, as murderers, celestials, adulterers, adventurers, alchemists, liars, and madmen. By the end, we feel the equivalent of a Nirvana; the book has recalled to us all of our past lives and we find we can no longer construe the future as mysterious. Contemporary peers of Márquez were likely able to dismiss the grandeur of One Hundred Years -- dismissal was probably requisite for confounding the urge to commit suicide in its wake. The novel's flaws can be stressed toward little value, but, for what it's worth, the book is flawed. The last third of the novel is a chore, and until we arrive at the last two paragraphs, we feel we've merely read a technical masterpiece with moments of genius -- we don't suspect we're about to be judged. One Hundred Years may be criticized, but the book is so rich, it transcends opinion. It exists as one of life's indescribable delights, like falling in love, tasting morelianas, and confronting the ocean in the dead of night. It seeks only to be experienced.